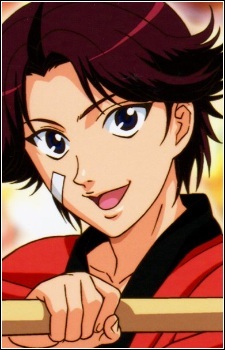 Seishun Gakuen 3rd Year Class 6 (Same as Fuji) Birthday: 28th November (Sagittarius) [Born at 06:28] Height: 171cm Weight: 52kg Blood Type: A Dominant Hand: Right Play Style: Serve and Volley Shoes: WILSON (Slash DTmid) Racket: DUNLOP (REVELATION PRO TOUR SERIES 90) Special Move: Kikumaru Beam, Kikumaru Bazooka, Kikumaru Step, Acrobatic Play, Diving Volley Hobby: Brushing his teeth, Wandering around pet shops Family: Grandparents, Parents, Older brother, 2nd older brother, Older sister, 2nd older sister Father's occupation: Office worker (News reporter) Fave Subject: Japanese History Preferred type: Cheerful, and someone he can share his laughter with Often visited spot in school: Gymnasium Favorite color: Red Favorite food: Soft omelette, tender fried prawns, shaved ice Favoite movie: Anime, fantasy Favorite book: Idol magazines Favorite music: J-Pop Favorite Date spot: Amusement park Most wanted item now: A new knitted hat Daily routine: Fighting over TV channel with brothers Dislikes/bad at: Going to the toilet at night Special skills aside tennis: Cooking, fly-swatting, collecting bugs Despite being a senior, perhaps Kikumaru is the most childish player in Seigaku. He likes to move around and hug everyone. Kikumaru is the other half of the Golden Pair, and because of their personality difference, Kikumaru and Oishi were able to balance their relationship as friends and teammates.